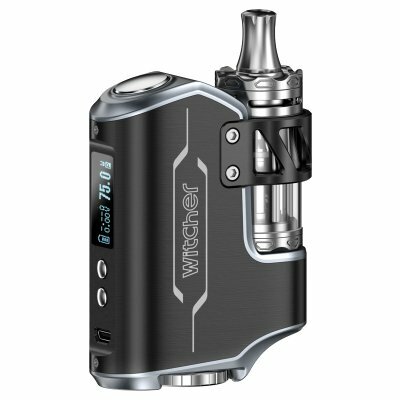 Successfully Added Witcher 75W Mod Vaping Kit - 75W, 5.5ml Tank, 3 Coils, Overheat Protection, VV + VW Mod (Black) to your Shopping Cart. The Witcher 75W mod kit from Rofvape is an all-in-one setup and their most elegant kit yet. It has an ergonomic style for perfect comfort in your hand and comes with a 75W box mod and the Witcher tank. Having a 7 to 75 Watt range and multiple power modes including VT-Ni/VT-Ti and VT-SS ensures you have regulated temperature control for nickel, titanium, and stainless steel coils. This versatility makes the Witcher vape mod a great starter kit for you to expand from. This Witcher tank has a 5.5ml capacity and in this kit, you will get 3 plug type coils for quick easier changes. These coils include a 0.3 ohm SS, 0.2 ohm Ni200, and a 0.5-ohm kanthal coil. The submerged tank uses a "Roman column" airway design for better atomizer airflow. Being a top loading tank and with adjustable airflow, you can easily top up this vaporizer with e-juice. The standard 0.5-ohm kanthal coil that comes installed in the kit can handle plenty of Wattage and will offer great flavor and large vapor clouds without you ever experiencing any burnt taste. Capable of fitting tanks with a diameter from 23 to 25mm and having a gold plated spring loaded center pin suitable for 510 thread connections there are plenty of options for this vaping kit. Powered by a single 18650 battery (not included) that is loaded into the bottom and covered by a threaded cap the Witcher mod has a super high 98% efficiency. A 0.69-inch screen delivers all the info you require such as output power, temperature and working modes as well as a battery charge indicator. The battery can be charged through the micro USB port with the supplied cable or swapped out for a spare by removing the threaded battery cap. With several levels of protection including 10 seconds time, short circuit, overheating, low battery, and atomizer not fitted protections the Witcher vape kit is easy and safe to use. This top vape kit from Rofvape comes with 12 months warranty, brought to you by the leader in electronic devices as well as wholesale vaping kits, mods and atomizers.. Came fast package was Really well Thank you for the delivery.